Summer is here and while that means ballgames and trips to the beach, it can also mean thunderstorms. Depending on where you live, some of these storms can be severe and cause quite a bit of damage. Your first inclination will be to check for damage. The second inclination will be to clean the yard of any debris. These are good thoughts, but you want to make sure you clean up correctly. 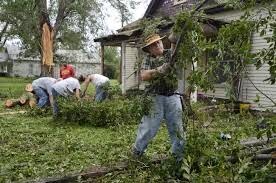 Remember, these storms can damage trees and shrubs and leave behind a trail of debris. You need to be careful when doing such cleanup work. Strong storms can bring down tree limbs and power lines. The first thing you want to do is make sure none of those fallen tree limbs are resting on power lines. If this is the case do not, under any circumstances, try to remove them. You must contact your local utility company to have those limbs and branches removed. Most of the fallen branches will be branches that have already died. Some limbs may have been ready to come down and were just waiting for a good, stiff wind. Don’t try and lift any limb that is too big for you to carry. Consider cutting large limbs into smaller pieces, using a hacksaw or a chainsaw for larger limbs. Do not cut the damaged limb in the middle. Instead, choose a cutting location just above a lateral branch. If large parts of a tree have come down and are in a difficult position, do the wise thing and call a professional. A tree pruning company can help with the removal. Check your lawn sprinkler system. It’s possible it could have sustained damage in a rough storm. Check all the zones and make sure the sprinkler heads are not damaged. This should be done before you try and use the system after a storm.